Rex the hero dog, a German Shepherd from Des Moines, WA, was shot three times and attacked by home invaders! The burglars had smashed the home’s rear sliding glass door possibly unaware that a teenage boy was upstairs with his dog. Rex was rapidly on the scene and, protecting home and hearth, went after the invaders, biting at least one of them! Rex was then fired upon and sustained three bullet wounds. He was shot in the neck and hind legs! The criminals fled the scene after hearing police sirens. Javier giving Rex some love while he recuperates. However, what the news folk all failed to go into was the rest of the story…how Rex became people aggressive to everyone and anyone aside from his immediate family and how the normal behavior training they initially attempted did NOT work! The truth of the story, of course, is that this is Not just another touchy, feel-good dog story – there’s more to it than that. Some segments of Rex’s news story even featured some dog trainer talking about PTSD and giving the dog food treats but the media’s story stopped there and failed to go into how that did NOT work for the family or for Rex or for society at large! Classic. The fact that Rex was now psychologically messed up and that the “positive” training they tried failed was NOT included in any of the media’s follow up reporting on Rex and the family. I’m not exactly sure why. It probably has to do with the fact that people these days are only familiar with telling one half of the story when it comes to our dogs. Only the good half. We tend to shy from what’s ugly even if it’s the God’s honest truth. But, if you’ve been a reader of this fine blog you know I do Not do that. I strive to be honest and direct and open like all dogs are with me. I know Abe Lincoln was on to something. When a large dog is aggressive towards people it is an issue that must be taken seriously. The sad fact is that we as people, no matter how desperately we desire it, don’t always see our dogs for what they really are or how insane they may be becoming. People are often misreading, mishandling, and mistaking our dog’s language and their training (for more on this – much more – read my first book, Dog Myths: What you Believe about dogs can come back to Bite You!). In Rex’s case it is a totally understandable reason to become aggressive and untrusting of other people, he was shot three times for crying out loud, but how do we move on? How does a person successfully lead their dog back into sociability? How do we lead the dog properly in order to vanquish fear and embrace living in the moment? Will keeping him as a “victim” truly help? Will stuffing his face with food treats truly help remove severe psychological damage? Will oodles of human comfort aid him mentally and emotionally? Will adding more training and rigid obedience help solve the problem? Many pet owners and many pro trainers would suggest giving Rex food. Food treats, when the dog is at a distance from a person in order to develop a “positive association,” is NOT the best way forward in a case like this and often will NOT work with dogs at higher levels of aggression BECAUSE dog’s can turn down their sense of smelling and tasting in order to turn up their fight/flight senses of vision and hearing leading them to ignore the food and continue escalating their energy by way of extreme, instinctual, predatory concentration directed right at the stimuli/person. Also, for many dogs, food is exciting – why add that to an already excited dog? Fighting is also exciting. (I know because I loved sparring in my martial arts classes and adored tossing boxing gloves on to do some backyard brawling with a buddy). Lastly – if one looks at literally every single dog on the planet, we see that they do NOT need to utilize food treats when interacting and relating with other dogs! Dogs simply converse with one another. The father and mother dog do NOT rely on a food treat in order to “condition” or “modify” their pup’s behaviors…instead they simply communicate using dog language. (By the way, the parent dogs don’t use brutal or harsh tactics either in order to effectively raise their young). Other people might suggest taking him to a former police or military dog handler turned private trainer because, well, they have worked with a lot of shepherds (German, Dutch, Belgian Mal.). The problem that we often hear about after this sort of training fails is that they’ll teach the dog to stand on a log for a long time, to work a bite sleeve efficiently, to jump a fence, and perform rigid sits, downs, and stays and will train them using German or Czech commands but…they barely ever consider what it takes to RELAX the dog. They seldom if ever consider what is important to all older dogs and dog “society” in general because the emphasis is always on working obedience and not on calming down and getting along. (FYI: we are very thankful for those serving in our military and for the military working dogs – both dog and handler do a great job serving and protecting our nation). Some times taking your Shepherd to a former LEO or military dog handler is overkill on working obedience when what most dog owners desire and desperately need is trust and the ability for the dog to get along with others at the local barbecue. One of the biggest myths in the dog training and behavioral modification industry is that the addition of obedience removes behavioral issues! Please reread that last sentence. The addition of obedience does NOT necessarily mean the subtraction of poor behaviors! If you fixate on obedience (which all mainstream dog training does) you’ve just added some juggling to your dog’s bag of tricks. Keep in mind the mother dog doesn’t care whether or not her pup’s can perform a “sit” command. Please think about what she cares about. Think about what dogs care about and need. I’ll let you puzzle that out. Thank goodness Rex’s family made a wise choice and did some well thought out research because they ended up eventually finding and working with us, Garrett Stevens’ Alpha and Omega Dog Training, on Rex’s behavioral rehab after trying all the other stuff. They drive a long ways to see us and the natural, spatial techniques we’ve gone over are working to help calm him down and get him closer and closer to how a normal, healthy, social dog acts and interacts with the world. Great job, Julia and Javier! Time to socialize. Socialization is always the answer for a house dog no matter what the question is. Living with constant fear is no life at all! If you have to begin on muzzle then begin on muzzle but socialize always! When I first met Rex he was intensely barking, lunging, jumping, and snapping at me while on leash. I instructed Julia and Javier on dog language and Rex’s need for leadership and for natural calming and proper positioning and leash manners. For weeks now I’ve been able to calmly lead him on walks, pet him, and help guide him back into what is acceptable behavior and energy within his family and within society at large as I try my very best to impart to him that not everyone is a bad guy looking to do harm to him or looking to hurt his family. I am realigning the dog’s senses so he can once again navigate his world. Trust is so important. We cannot get to trust though unless we have real respect too. Respect and trust don’t come from food (even if your local trainer is forcing the food down your pup’s throat). It doesn’t come from a certain rigid training method. Respect and trust do not come from raw obedience either. Respect and Trust are something altogether deeper. Remember, reinforcement in dog training and behavioral modification is tremendously overrated. Relationship has almost unlimited potential! Forget “positive only” methods and forget punitive mostly – focus on how dog’s relate and your dog will thank you! It has been a privilege helping Rex the hero dog and teaching his family the ins and outs of efficient dog handling and relaxation techniques directly from the Garrett Stevens Method and Mother Nature. Rex has come a long way. He, like all of us, has more to learn but we are glad he’s learning to self soothe and to truly calm down and follow Julia and Javier’s lead. Here’s to a bright future for Rex and the family. 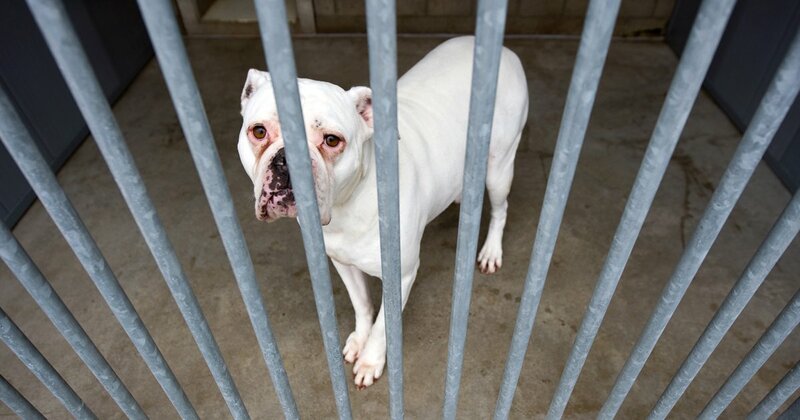 Today many dog rescue groups are working tirelessly to help an overwhelming number of dogs that have been physically abused. And although we know several of these same dogs have also been mentally abused once they are taken in, treated physically at the vets, and then placed in the rescue organization it seems we (as a society) are largely clueless about how to help them finally move on to a successful, relaxed, playful, “happy” dog life! Dog owners can’t seem to get past the dog’s past. It seems there is a large disconnect when it comes to solving mental abuse. The whole focus after the new rescue dog is checked out and treated by the vet (and, Dear Reader, often if the dog is dangerous to people the vet gives a quick visual inspection…NOT even Touching the dog during the half-hearted exam!) anyway…the focus then shifts to fostering and simply getting the animal a “forever” home. I’ll tell you now – it’s too quick! The dogs aren’t ready. And they will NEVER be ready if the vets or volunteers aren’t prepared properly or don’t know what they are doing! So, invariably, many dogs are returned a couple days or weeks or months later for aggression, phobias, anxieties, destructive behaviors, housebreaking issues, and in general because they were adopted out while still needing massive amounts of natural, calming behavior modification and socialization. There is a giant disconnect and it is 100% behaviorally related between when the rescue dogs arrive at the vet/rescue and how they are handled while in the rescue to prep them for their new homes. THIS is where many mistakes are happening and this is why so many dogs can’t be adopted out or if they are they come back so quickly or remain in their new home only to attack people or other dogs or cats! Let’s take a closer look. These dogs were (usually) taken out of physically or socially poor situations but then they are placed in very well-meaning but still mentally poor situations! They are treated physically (somewhat) but then viewed as these poor, pathetic, victims and then typically forced right into a “positive only” -bribery and high excitement-based training philosophy that was doomed to fail from the beginning! At this point, if they aren’t biting too much or if they are a physically good looking dog they will be adopted out…at least for a few weeks. And, as discussed above, even if they are a danger to society many shelters/rescues will STILL try and adopt them out!!! Once in their new home the dogs are most usually babied. (something any older, normal, social canine would never do to a younger pathetic newly placed dog or pup) If we, as people, act like pups and talk in high pitched tones all the time to our rescue dogs they may seem to like it but in reality you are just pumping them up in their energy as you attempt to “Sell” the dog on your friendship and love. Most folks seldom if ever ask themselves what does this dog need mentally/psychologically from me? Most rescue owners never honestly observe and learn from how a calm, social, normal dog would handle meeting one of these fearful new rescue dogs. (Excepting, of course, you fine followers of this blog. You and I now know better.) If one did consider how calm, socially normal dogs function in their society one would soon discover that dogs start out with a quick smell to identify and meet the dog then the calm, social dog would usually do the right thing and IGNORE the nervous, neurotic rescue dog. They lead dogs play a little hard to get. The ignoring is to establish who’s in charge and let the new rescue dog know that it’s the social and friendly way or the highway! The ignoring also signifies a degree of trust and freedom in the newly blossoming relationship. Healthy older dogs do NOT rush to sell or force a relationship the way 99% of people do with dogs! Do we do that when we are introduced to a new dog? Do we follow the dog way? Or are we adding to the problem and bumbling through life? Most people are totally wrong when it comes to rescue work! They feel bad and present weak energy toward the “victim” dog. And the dogs, being naturally intelligent creatures that depend on a pack to survive, quickly start manipulating more and more control of their bodies and then their crates and then whatever the hell else they want to manipulate or claim or control! Their fears then grow and grow until they are biting anyone for touching “them” anywhere or flipping out on people if they go to walk by “their” kennel, or “their” food, or “their” owner. 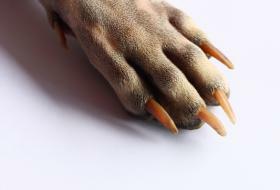 It is a horrible and slippery slope when fear manipulates more of a foothold in the dog brain. And it always, always, always does if the training methods are poor and if we, as people, do not follow nature’s wonderful example. Please understand me. I am on the side of the rescue groups and all the hard working volunteers and vets that spend their free time in so noble a pursuit as helping those animals that sometimes cannot help themselves. I am aware that there are thousands upon thousands of dogs that are in the rescue organizations throughout this wide world. And I am just offering a bit of honest advice as a pro trainer/behaviorist to help rapidly advance the cause of the dog in order to actually help these vets, rescue leaders, and volunteers and that in turn will help the animals both mentally and physically. Tom Jefferson, writer of the Declaration of Independence and noted brainiac, and our third President said, “Honesty is the first chapter in the book of wisdom.” Have we taken a healthy and honest look or is rescue work over-emotionalized to the point of lying to ourselves and others about whether a dog is a danger to our own children and to society at large? I for one want to save as many dogs as possible but I want to help them physically as well as mentally and emotionally. We must seek out better solutions than what is happening currently (in 2018). I want better. I want better for my family and our neighborhood. I want better for my country. I want better for the dogs. These rescues need to wake up and focus more on quality as well as quantity. They need to stop fudging their rescue numbers and look at the truth of 5 MILLION reported bites a year in the USA alone. (And those are only the reported ones!) They need to look images of the 39 people killed in 2017 by dogs (most were killed by their own rescue dogs). I wanted to share this with you all because I see and experience and have to do my darndest to avoid getting bit while actively rehabilitating dogs (behaviorally) that were in no way ready to be released to the public yet the rescue group adopted them out! For more insight on dog and human behavior order my hot-listed book, Dog Myths: What you Believe about dogs can come back to Bite You! Check out the stellar reviews on Amazon and read how our book is changing households and calming and reversing behavioral issues! Also, you may want to check out my newest book, So Long Separation Anxiety it gives real-world, hands-on, calming spatial solutions to successfully treat anxiety in dogs and prevent it in puppies! 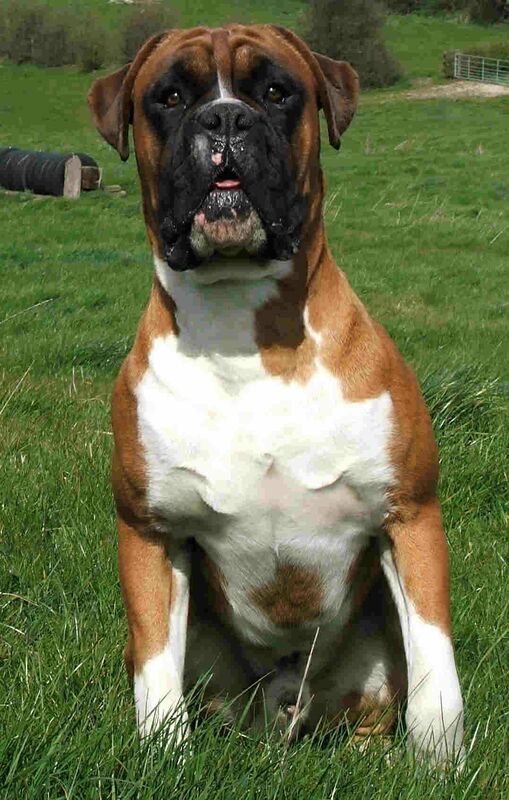 Rocky was a large male boxer. Powerful, stubborn, hyper, and completely neurotic. Rocky’s owners could not take him for a walk. He was out of control. He would pull, lunge, bark, leap in the air, snap at all manner of things – up to, and including, people. He was nervous about everything…wind chimes, people, cars, birds, cats, trees or leaves blowing in the wind, other dogs, and a host of other common, everyday things. I decided I was going to take Rocky for a walk. The walk would be an attempt to get him to heel (walk loosely beside or slightly behind me without lunging and attacking anything). I wanted to get him heeling so he could bond more naturally with me, burn off excess energy, and learn to follow me and then his owners. The owners wanted to be able to walk him normally without all the insanity and aggression, drama, and without the public embarrassment, the outright danger and liability, and the excessive wasting of the dog’s energy and the frustrated owner’s energy. To start I had to somehow get in the door without being bitten as this was also another of Rocky’s many issues. Rocky was territorial. He loved his family but was dominating everything he could and doing it out of nervous over-excited energy. I tried to remain as calm as possible as they greeted me at the door with Rocky right there. Please keep in mind, Dear Reader, that I did not know nearly as much back then as I do know but was “jumping in the pool” and taking a risk. As I look back I realize that it was quite a risk I took because this dog was an excitement junkie hooked on fear and aggression. He lunged for me as I came in the door but his owner had him on leash and pulled him back. I went into introductions all the while attempting to ignore the threatening and aggressive body language of the dog. Ignoring a dog can be a great safety measure when dealing with certain displays of aggression, fear, and escalated energy. The ignoring is a method learned from watching older dogs and how they handle and raise younger pups. It is the puppy who acts excited, foolish, and is initially an energy-waster. That excitable behavior is the total opposite of how a more mature, socially-adept dog would enter a territory or meet another dog or pup. This statement should instantly bring to your minds the question of how you meet and greet other dogs or puppies that you encounter, and also consider how the trainer you may be considering meets and/or greets your own dog or pup! This can be quite telling. Are we acting calmly, like a leader? Or are we imitating and acting like puppies ourselves?! Are we pumping up the dog or pups’ energy?! If so please keep in mind that that is very poor leadership on our part and completely opposite of nature’s way! Continuing…I was able to come in the door without getting mauled. We spoke for several minutes on how to calm and lead a dog, mother nature’s way, the differences of dog training and dog whispering (for those readers that don’t know, I can do both methods but dog “whispering” or whatever you want to call naturally communicating calmly through space and energy -if done correctly- is much more natural, calming, and beneficial for the animal and our relationship with it and it always succeeds socially where other forms of training and behavioral mod. do not!) We spoke of other useful info all while Rocky was on leash and close by yet not close enough to bite me. I was purposefully stalling as I gave all the vital info concerning their dog and this allowed him to calm down and deescalate. I remember when I went to take the leash from the husband, Rocky kept lunging up in the air in a wild attempt to bite my hands and arms! When I took hold of the leash (and my destiny for the next several years) his claws raked and scratched me as he clutched onto whatever flesh of mine he could find. He was flailing and attempting to bite me and bite the leash or whatever he could get his teeth or paws on! This may not sound like much to many of you but I have had scars that have taken close to a year to heal up just from a dog’s gripping claws! Those babies can do some damage when they’re frantically wrapped around your bare arms! Today when I look down at my forearms and hands I don’t see any scars from Rocky’s claws. 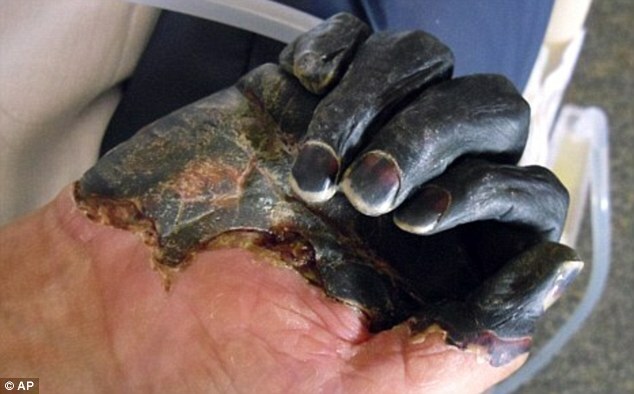 There is, however, one small scar from his teeth under the fleshy part where my right hand meets the wrist! I remember my blood was flowing freely on that session. I continued to let Rocky waste his energy as he attempted to bite, snap, nip, scratch, throw himself on the ground, bite the leash, and twist like a whirling dervish. Some time later I felt he was calm enough to begin the walk. This is another point in time where being extremely sensitive to the dog’s body language and energy comes into play. You have to be super observant and patient yet active and willing to push the envelope. We need the dog to go beyond the fearful or neurotic comfort zone. Fortunately for me I’ve been an extreme animal nerd my whole life and have a well developed eye. Growing up I lived in Massachusetts, Florida, Maine, and Maryland. Very different states with different animals. I was able to catch frogs, toads, mice, lizards, snakes, turtles, and of course we owned several dog breeds over the years, many differing reptiles, some amphibians, a couple cats, and the occasional bird or rabbit. 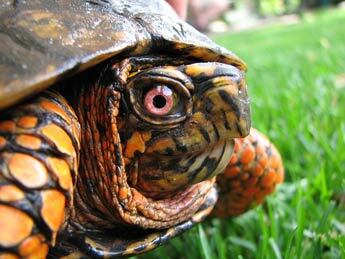 As a child my first official pet was a box turtle named Speedy. I got Speedy when I was around five or six years old. My dad drove me to this run-down home that was converted into a too-cramped pet shop in a small Maine town. It was jam-packed with creepy crawlies and furry bodies around every tight turn. I was fascinated. I remember seeing some python or boa almost bursting the sides of the dirty glass aquarium it was in, a raccoon in a wire cage, a skunk or two, and of course, loads of birds and reptiles. Looking back, I can now say that Speedy actually had a great effect on the course of my life. To my curious young mind this animal perhaps was a left over dinosaur that I could handle and study. I clearly remember feeding him raw hamburger, bananas, strawberries and other salad stuffs. I picture him walking around our apartment in Maine so many years ago. I recall misplacing him once and then discovering him later in my clothes closet. Upon his death we buried him in an empty Girl Scout Cookie box. I still hold the opinion that his casket was just a bit too small but it was a great memorial service to honor a unique pet. This imposter will have to suffice. I don’t think I have any pics of the real Speedy. When I got my first job at fourteen it was at a pet store. Clara’s Tropicals: a small pet shop specializing in tropical creatures in Maryland. The first thing I ended up bringing home was a juvenile green iguana. I named him Sam. A few years later I had acquired another. Sam and Max were kept within a hand-built, custom, six-foot-high cage. I’d make them a salad everyday. As the years went by my animal collection and my knowledge grew. I added a friendly Pac-man frog named Newton. (Most horned frogs are not friendly. They are an interesting species of frog that actually bite people and have teeth! This actually makes them very unique as most amphibians do not.) Newton was the bane of many a goldfish. My second job was also at a pet store. House of pets. This store was not nearly as nice as Clara’s but I got to mess around with and care for caimans, tegus, monitors, rats, boas and pythons, chameleons, turtles, ferrits, and several other critters. I was learning a ton about animal husbandry (through self education and intelligent observation) and occasionally handling some serious animals that did not desire to be handled by anyone. Some of the caimans would snap at you if you weren’t careful and the tegu lizards and the monitors can be down right nasty! There were some creatures I would only handle with gloves (Tokay gecko and a large green vine snake come readily to mind). I also had acquired a bearded dragon named Roy. Roy ate crickets like there was a coming famine. We supplemented his diet with some salad and the occasional baby mouse. He was very docile and I will, even to this day, recommend bearded dragons for those of you considering a lizard for a pet. I know for certain there must be thousands of you out there reading this fine blog and thinking something to the effect of, You know what would really complete my life…if I only had a docile enough lizard sitting on my shoulder right now. Well, now you know what my pick would be. I was going to go further into the other animals and all the differing breeds of dog that my father would bring home for the family (usually free or extremely cheap and found from ads in the newspapers) but several of these pets did not last long in our house. These intrepid animals would live with us often until they showed a problem or a behavioral issue was discovered and then they soon found themselves back in the paper and or in another home! We never mistreated them but many certainly didn’t have too long of a stay with us. Although this is not recommended for the animal – it did afford me, during my childhood and teenage years, vast exposure to many differing breeds and personalities. Due to the length of this post let’s just get back to Rocky the aggressive boxer and suffice it to say I was “good with animals” shall we? We made quite a pair walking down the street. After bearing the brunt of Rocky’s claws all over my forearms I was bleeding. Rocky, after fighting me on leash and twisting like a crocodile going into a death roll, was heavily panting and frothing at the mouth. I’m pretty sure his tongue had tripled in size. Somewhere during all his rearing up and flailing, his teeth had snapped forward and cut my wrist. I determined then and there that I was going to either bleed out or we could strive to have a normal stinking walk. I would die trying. We pressed on. Eventually we were both tired and bleeding and sweaty (dogs do sweat despite what you may have heard. They sweat from their paw pads). Rocky had settled down due in large part to an iron will and decent dog-handling and we got through the difficult time all without bribing or beating (no need for positive reinforcement and no need for punitive either)! He was heeling beautifully when we arrived back to the client’s home. They were amazed. I was happy. Rocky was calm. He was respectful towards me and now trusted me. We were able to touch one another much more freely. I would greatly build on this in future sessions with Rocky. I then experienced a sort of glow, I suppose. I’m not sure whether the clients noticed or if this sort of thing even shows from the outside or on my countenance at all, but I’ve noticed this happens in my life internally whenever I am able to achieve something wonderful. A burst of renewed energy (maybe joy) wells up within me. I had done it. I was a professional trainer, albeit very inexperienced, and had truly helped this dog and the results were plainly there for everyone to see. It all happened within our first hour together. 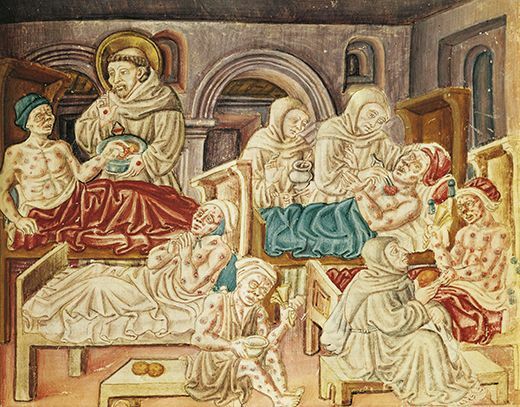 There is a plague spreading! This atrocious affliction is assailing families across the country at a truly alarming rate. If, and only if, you can identify the symptoms you may have a chance for survival. Alice Jones arrives home after an uneventful day of work. Alice has developed a strong and recent loathing for her boss but that’s a story for a different time. She walks through the door and is greeted by Jethro. Jethro jumps up on her and wags his tail; a happy tan furball in the lamplight. After tossing her work outfit in the hamper and replacing it with a pink sweat suit Miss Jones trots down the stairs and heads towards the bench near the door. Under the bench her shoe pile awaits. Jethro is beside himself; the ritual of the evening constitutional almost more than he can bear. Alice plops down on the bench. She grabs her favorite jogging sneakers. The stitching in them just beginning to open up in places. The sneakers will need to be replaced within a few short weeks. Jethro, a large brown beast, snorts his excitement and continues his dancing. Alice grabs the treat pouch affixing it to her sweatpants. Jethro is finally able to sit after being told six or seven times as she puts the leash on him. They go out the door and into the cool evening air. Alice and her dog keep a brisk pace as they pass the first block. They pause to look both ways before crossing. Alice’s eyes darting here and there scanning the lonely intersection before continuing onward. Jethro strains – keeping the leash taut and panting all the while. Alice increases her speed to attempt to match her four-footed friend’s. Then it happens. Alice inadvertently tenses. It was a bark. Turning quickly to her left she hears the bark again before she sees the rushing dog’s form through the fencing. Jethro goes buck wild. Jethro is dog aggressive. Alice spits out a curse attempting to restrain seventy pounds of muscle, teeth, and fur. What was it the behaviorist had taught her? She reaches into her treat pouch and grasps for the food. Rifling through the little bag at her hip, she is just able to pull out a small treat. As Alice struggles to maintain her footing in the dark night, keep her shoulder in it’s socket, and keep Jethro from climbing the neighbor’s fence and biting the barking dog she wonders why her dog has made so little progress. So little progress even after hiring a professional behaviorist? Anger, frustration and desperation all begin fighting for the throne of her emotions. Jethro lunges again and again, straining at the leash; fighting for leverage. His brown eyes like laser beams of concentrated fury. The dog’s energy rises with each passing second. Alice speedily shoves the treat almost into one of his nostril’s and as instructed yells, “Watch me!” She brings the treat back up toward her own face. No change. Zip. Zilch. Zero. Jethro has now almost reached the fence several times and has almost spilled Alice onto the sidewalk below them. This exasperating spectacle continues on for another minute. Alice finally resorts to straining her damnedest and eventually is able to yank Jethro past the end of the neighbor’s fencing. They escape the barking dog and continue into the night. Later Alice and Jethro arrive home. The dog – wagging happily from the walk. The person – defeated and vexed from the battle. This phenomenon is happening now and occurs all over the world. The plague we forewarned you about, good reader, was not the dog-dog aggression. The terrible epidemic we are specifically talking about is the weak and inefficient method commonly used to fix the aggression. This is the same bad method used in countless situations across the globe. The same method that brings about little to no change and IS the bane of unsuspecting dog owners…and it is so sinister because it is consistently sold as the cure! The method described in the story above is constantly sold as the solution! And caring dog owners buy it hook, line, and sinker. And what a “sinker” it is. It causes hope to sink. It causes confidence to sink. It causes human emotion to sink down into the mire and muck until the poor dog owner is so beaten down by the continual losses, so very distressed and afflicted by this plague they soon give up. They give up because they have already tried dog training and it did little to no good. Maybe they already paid top dollar for a dog behaviorist and the method may have worked on their dog at a far distance from another dog, or it may have worked just slightly when the dog was less distracted, or in a controlled setting, but not in the real world and certainly not for lasting results the owner was anticipating! Folks, this goes far beyond obedience training for dogs. This sad and pathetic yet all-too-common story is a perfect illustration showcasing the piss-poor methodology of a humongous majority of dog behaviorists and dog trainers. Attempting to perform a “watch me” command or a “look” command using a food bribe while a dog is beginning to freak out on another dog (or person, or cat, or squirrel, or mail carrier, etc) is the scourge that we fight daily. This is a Plague! You would probably not believe how often I hear my new clients recount (like Alice’s dreadful tale) their similar poor experiences with professional dog behaviorists and dog trainers. My question…When, When, When will we realize that bribing anyone at any time INSTANTLY makes for a less healthy relationship. Any and all close relationships have several ingredients included in order to be successful and close. Respect would be the glaring one in a case like Alice’s. Jethro had zero respect for her and he showed it in dog speak. He showed how important he viewed their relationship as he practically abandoned it in an instant to give direct attention to something else. This was terribly rude to Alice. And totally unacceptable behavior if Jethro was a human being. This behavior however is tolerated many times in our relationships with our dogs. Imagine the human equivalent of the Alice/Jethro relationship with me for a moment. Let’s say you are having a conversation with someone and you are in mid-sentence and out of nowhere they just totally start ignoring you. Not only that but they start jumping around, staring at something, and begin screaming out their over-excitement. Puzzled you turn around to see what they are going on about and see your neighbor casually mowing his lawn. The person you were just talking to is going bonkers now…dropping F-bombs, needing to be physically restrained while they bodily threaten the neighbor; all the while screaming their head off. The troubling thing is that this is extremely common because your neighbor is out there typically every couple weeks to trim up his lawn. Now, as a concerned individual, you ask them to stop. You are totally ignored; blown off as if you did not even exist. The sort of extreme ignoring that would impress even the most snobbish of royalty the world over. The person you used to be talking to, maintaining directed intense eye-contact and the continued onslaught of monstrous insults at the hapless neighbor is becoming quickly uncontrollable. You take it a step further and decide to step in front of them. This individual, like a professional athlete, slips left and continues the disgusting yet powerful display of raw energy and physicality-curse words flowing toward the neighbor. What is a caring person to do with this Tyrannosaurus-type-terror? Bribe them? Beat them? WHAT??? Should they always look to us for reinforcement? Should our friends, coworkers, or children (or dog for that matter) as intelligent creatures ALWAYS look to us for reinforcement? This last question is a critical question because it is where my beliefs on dogs and their training and behavior differ from almost all other dog trainers and dog behaviorists I’ve ever met, read of, seen on TV, or even heard of! I believe we should NOT always be the answer for our dogs. Just as our human children grow we should NOT always be the answer for them. ALL GOOD LEADERSHIP IS ABOUT DUPLICATION, DELEGATION, and DECISION MAKING. As a father of three great kids one day I may not be there when they have a tough decision to make. I may not be there when they are pressured to try drugs. I may not be able to be there holding their hand as they apply for their first job. But I do my best to be the best leader I can be and equip them as much as possible so that when I am not there they can make an intelligent decision on their own. Good leadership is the key on the parent’s part. Maturity is the goal for the growing child’s part. For a healthy relationship we need both respect and trust. How can we trust the child if they don’t respect us? How can the child trust us if we don’t respect them? It is a two-way street. I find it fascinating that Bribery is a crime in our society but yet highly, highly encouraged by dog behaviorists and trainers when it comes to our close relationship with dogs. Bribery is actually a CRIME in our society!!! Why is it sold to us as the most “positive” way? This is amazingly bizarre. And this is foolish! Bribery needs to stop if we want calmer, healthier, more social interactions from our dogs and pups. PS. Please keep an eye out for the exciting conclusion to this post as we will examine what happens if the food treat/bribe does actually work and the effects on our relations with dun, dun, duuuuu…. (exciting musical crescendo here)…..our dogs! Fathom the insanity of a human being who teaches you that you can never disagree with your dog! People are nuts. We are. If you can’t agree with me that people are nuts please stop reading Now. For those that can recognize that as humans we are a bit crazy I want to direct your thoughts towards this current crazy time in history. This interesting time in our lives where we find we have several thousands of professional dog trainers and professional behaviorists that actual teach and want to keep teaching you (as the owner of your dog) that you shouldn’t ever disagree with your dog or pup! Think about that for a second. What have we come to? How has it come to this babying, this coddling, this ridiculously imbalanced and greatly disconnected, poor-excuse for a relationship with our dogs? How and why do so many pet pros talk dogmatically with 100% absolutism (and quite ferociously toward anyone who might disagree until they are shouted down) about the evil of corrections and that you should never “force” your dog to do anything? I encourage you to take those questions ponder them honestly and then consider and ask why we also currently have a terrible dog bite record (dogs attacking humans and attacking other dogs) and it’s been steadily increasing for the worse! I know the two are deeply connected! Don’t just go with the majorities opinion on this topic of disagreeing with your dog vs positive-only and force-free methods. Please THINK for Yourself and come to your own conclusions. Examine history, examine the stats, examine the methods of different pro trainers and behaviorists (and especially note and examine their results) and most of all… examine your own dog and the history of dogs and how dogs think and how they experience the world and how dogs communicate and behave. Then ask yourselves…would the mother dog or father dog constantly bribe their pups with food treats? Would they constantly attempt to condition them or would they seek to build a healthy relationship based on the dog language and respect and trust and manners (not frivolous tricks and obedience commands)? Would the parent dogs ever disagree with their young? Have you as a parent ever had to disagree with your own children? Was it beneficial in any way? Did you overdo it or under-do it? What is lacking in our current culture is the balanced approach to disagreeing and so the pathetic “positive-only” dogmatists (who aren’t really that positive in their own lives) scream and shout about how any correction, any disagreement, or forcing your dog or pup to do anything is totally wrong! Let me tell you outright…this is hogwash and they are wrong! It’s only wrong to correct or disagree if you are performing it wrong. Dogs speak through movement, energy, smells, and touching. Most people I meet (and I do this non-stop) are woefully, dreadfully unaware of the intricate and marvelous language of our dogs. They are woefully unaware because MOST pro behaviorist and trainers are horribly unaware! The common pro trainer/behaviorist whole premise and approach to training is not beneficial and does NOT prevent behavioral issues from developing!!! But let’s cut them some slack for a moment. I don’t want to be too hasty. Maybe these “professional dog trainers” and “scientific professional behaviorists” haven’t ever see older dogs and how they talk to and deal with younger dogs? Maybe they haven’t seen the older, balanced dog correct and address the younger imbalanced one? Maybe these so called “pros” haven’t ever visited a local dog park and observed the dog language? Maybe they’ve been too long in the library reading about dogs or too long in the laboratory or in the classroom? Maybe they haven’t had kids of their own or cultivated healthy relationships in their own personal lives? I don’t know. What I do know is that anyone who proclaims the “positive-only” approach or acts as a behaviorist and over-charges their clients because they used to work with dolphins is NOT keyed into the amazingly close and wonderfully easy and direct relationship available to us with our domesticated dogs and pups! They say “Never force a dog to do anything.” This is horribly bad advice! I force dogs to do things all the time (and I do it incredibly gently and smoothly) and they end up thanking me for it! And the owners are also able to soon witness their once terribly behaved aggressive or fearful dogs actually make good decisions. They see it happen before their very eyes! One example: I force the nervous dog into social situations and then ask it (in dogspeak) to behave itself (not just do frivolous tricks). This is the only thing that will change the nervous dog into being social and normal and balanced. I am a professional because I equip the owners and the dog and get them social extremely quickly all while expanding the dog’s capacity for more and more social situations and all without harsh corrections and without foolishly stuffing food treats down the dog’s throat non-stop and calling it science! Yes, positive reinforcement is science…it’s OLD science and based on the external motivation of the dog and none of it’s internal drives and motivations! I’m not even going to bring up the fact that bribing with food is also highly exciting and that over-excitement is the cause of every single behavioral issue any dog faces. Food treats is not the natural way of parenting. Bribing with food is how most trainers train WILD animals and that’s fine…but for our domesticated dogs…it’s crap! Let’s all recognize that many humans are insane and let’s take measured steps to respect their beliefs and opinions, however crazy, but understand it is more than ok to adamantly disagree with their foolishness and to think for ourselves. Your dogs and pups will thank you! Seek out the natural ways. You Can reward your dogs and pups but you Can also disagree with them too and sometimes “force” them into areas of their lives that their fears or aggression would never have taken them before your help! Stretching the capacity and enlarging the relaxation is the name of the game! Remember both rewards and corrections should not be the focus…A HEALTHY RELATIONSHIP IS THE FOCUS!!! Questions? Call us! And keep an eye out for my coming book…it’s gonna’ be epic! And balanced with natural techniques and they will, of course, get you the best results you could imagine! Forget positive or negative reinforcement and focus on being a dog parent. Group classes for dogs can make your dog’s behavior WORSE!!! Let’s say, for example, you just received a new, cuddly, bundle of furry energy. Whether it’s an 8-week-old puppy or you welcomed a cute, scruffy-looking, rescue dog into your home the next logical step besides getting all the required vet bills out of the way would be throwing them into a group class, right? That will stop your dog from become Cujo, correct? Group sessions around other pups will mold your young pup into a wonderful, social, well-mannered dog, right? That is what Socialization means, isn’t it? WRONG! When will we ever get this notion out of our minds? This notion that Group classes are just standard operating procedure and that if we attend one our puppy will grow up to be happy, healthy, well trained and social. We’ll get rid of the notion probably as soon as the giant dog supply chains (who also double as “trainers” and who happen to have all the treats in the world to sell to you in order to “train” your dog or pup) end up going out of business. Which will never happen because many of us (as humans) just may be mindless zombies who, instead of supporting local training, grooming, and local treat companies, have to take a walk into what is the equivalent of Walmart-quality dog training at your local super pet store and then have to sign up for group classes! Please understand me, I shop at Walmart occasionally but whenever I do so I know that there is a pretty high chance I’m not getting the greatest quality or service of whatever I’m shopping for. And I’d like everyone to know that this analogy is strikingly similar to what is happening in the dog training world with these giant companies. And currently it is happening with loads of private start ups too – some kid finds out they can make a quick buck because they can get a puppy to into the sit position while bribing it with a treat and suddenly they’re a “trainer!” Please hear me…If you want the cheapest of everything than you’ll get the weakest of results behaviorally speaking. In this post we will examine the pros and cons of putting your dog or puppy in group class training. The one pro of dog obedience group classes is that occasionally the dog can learn some “typical” and “regular” training out of the class and get a bit more social at the same time. You can use the distractions to strengthen your “sit” or “stay” or “down” or “come” and leash/heeling skills. My question is, Can’t you do almost the same exact thing at a busy park nearby? Can’t we do the same thing as we walk our pup through Home Depot or Mud Bay? There are pros to the group class but please be aware there are several cons to the classic group class that the majority of people never even consider! Socialization does NOT just mean getting your dog or pup into a group class. Socialization is much more in depth than that. In fact it is one of the most important thing in our dogs behaviorally speaking. Socialization is the continual process of exposing our dogs to new touches, smells, tastes, sights, and sounds. Socialization is the active quest to cram in as many different experiences as possible so our dogs learn how to follow our lead and how to handle new or stressful situations without triggering a fight/flight response. Socialization is more than a small time frame that occurs during the first few weeks of a pup’s life. Socialization is all important. The more social a dog is the less behavioral issues a dog will suffer. 1. Group classes are extremely unnatural. Your dog or pup will be overexcited . And because your dog or pup is overexcited you will need to work extra hard just to get it’s attention. This means you will have to either increase food rewards (which almost always leads to excessive bribery) or, depending on the trainer and the owners, you will have to increase more discipline and corrections in order to gain the dog’s attention. Are you starting to see the problem? Never mistake excitement for happiness -especially in an animal. All of the creatures on earth teach their young that calmness and energy control lead to surviving and maintaining unity in the family. 2. In a group setting you will have people and dogs at different levels of learning and handling skills. Many times the group class will advance only as far as the weakest link is advancing. Group training cannot be custom tailored to fit your specific needs or your dogs specific issues. 3. Group classes have a set curriculum that always involves more “typical training.” You go there and will do “sit” exercises for the first hour. The next week you attend the group and you do the “down” exercise for that hour. Are you following me? And the week after – if you’re still attending and haven’t died from boredom – you work on loose-leash walking. Your time could be better spent. 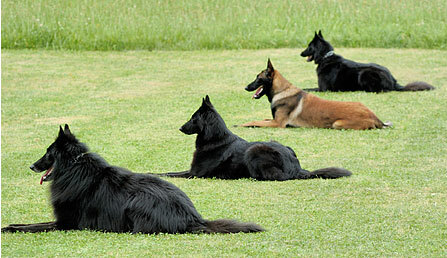 Most folks who attend group classes are under the common assumption that if their dog or pup would just listen to them enough to sit or down or go and stay on their bed or come when called their dog would then stop disobeying, stop being hyper, stop being destructive, stop being dominant, stop being over-touchy, and stop being aggressive or fearful. This is simply not true. Regular or typical training seldom prevents or fixes most behavioral issues! This is a good depiction of “typical” or “regular” training. Most folks would find this impressive or wish their dog could do this but this is exactly the problem facing our society and our dogs…it’s fake! The dogs are clearly Not relaxed. They are maintaining focus on their handlers. They are doing perfect down stays. But they are not relaxed and that in and of itself is the single most important thing for preventing or fixing ANY behavioral issue! What happens when they are not being told directly what to do by their owner? That is the most important question. 4. There is an even more unnatural trend occurring in group classes where several companies use partitions/dividers/separations if a dog is too hyper or aggressive or fearful to continue within eye-shot of the other dogs or people in the class. This is ridiculous and will never work to fix your dog or pup’s escalated energy. It can, in fact, make it worse. Another crazy technique that I’ve heard some training company’s are now using is to back tie or tether the dog or pup to a post or the wall so the dog simply can’t reach the trainer or handler or person and cannot jump on them. This is insane and will definitely make your dog worse! Any trainer or behaviorist who knows even the first thing about dogs knows that if they are pulling on a leash or tether they are escalating their energy. Anyone who knows anything about protection dog work or Schutzhund training also knows that back tying a dog is a great way to make them more territorial and protective – not less jumpy and calm! Please beware horrible trainers! Pulling creates more pulling! Notice the taught leash. Notice how comfortable the dog is pulling in his harness. Shocking, I know, but harnesses were designed to enable dogs to pull. Never tether your dog or pup unless you want to increase territorial behaviors. Work to develop a great heel to prevent excessive pulling. 5. Imagine you want to start learning to play the violin. You have two options. You can start with a beginner group class where the teacher is instructing a few students and making everyone go at a similar pace or you can hire the best private tutor you can find. Now imagine the great difference in how you play the violin and how much further you would come in a shorter time period studying from the master musician. It is the same with private training sessions vs the group class setting. 6. Dog owners who think “training, training, training” are actually much harder to teach mother nature’s calm, firm, relaxing ways to. And their dogs are harder to teach also. The dogs who have had a lot of “training” will keep trying to do sits, downs, shakes, etc instead of just learning to self-soothe and calm down and be social. They act like robots instead of a calm, social, animal that has good energy control, self control, and is not selfish or dominant. Private sessions, on the other hand, are totally customized to meet your specific needs in and around your neighborhood with real-life scenarios. Group classes can never match up. Never mistake real socialization for a group class. Socialization is much more in depth than any group class could ever be. Seek to duplicate real life situations in your training; that way you have real life results! I am not suggesting you don’t attend a group class with your dog or pup. I am saying group classes are only one very, small part of your quest to socialize your dog and sometimes they are unnecessary and many times they even do more harm than good! Don’t over do it with “training.” Do not be fooled – group classes will not usually fix any serious behavioral or energy issues. One item that can help anyone with any aged dog or pup would be my hot-listed book on dog and human behavior and language. Hundreds of people are ordering and reporting back to us on the great success they are achieving by applying our very natural (yet shockingly different from the mainstream status quo) methods of behavioral rehabilitation and training. 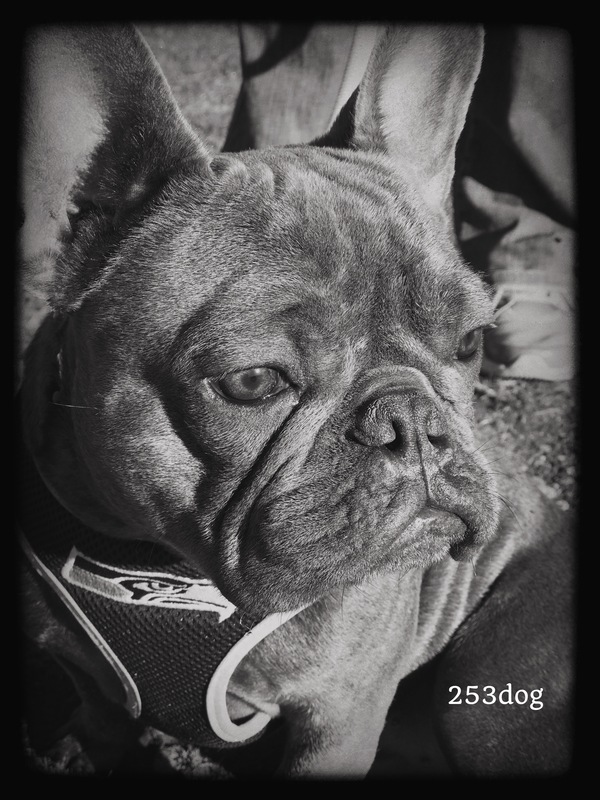 Here is the link…do your dog and yourself a favor – order this bad boy! It will definitely shock, then equip and inspire you to a wonderfully beneficial relationship which, in turn results in great social behavior! Dog Myths: What you Believe about dogs can come back to BITE You! Get Dog Myths, or my second book, So Long Separation Anxiety, read it, love it, then tell everyone you know about it!